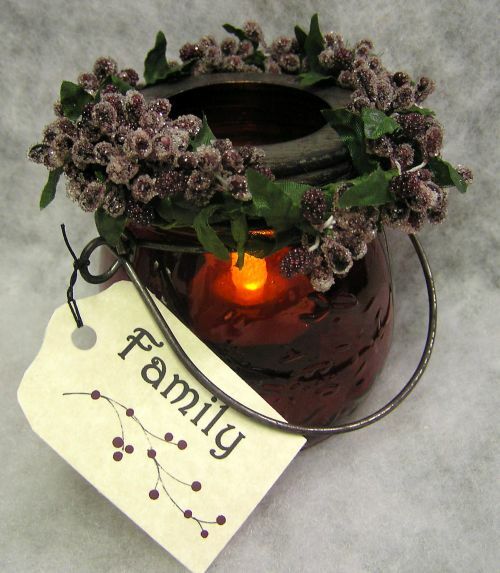 This unique Manchester Cottage creation features a deep red glass jar with a black iron handle. It has a frosted berry leaf garland around the top, hand painted tag that can be personalized on the back, and a votive candle held in the black iron holder. It comes in two styles: "Friends" (shown) and "Family" (click on photo to see this option). 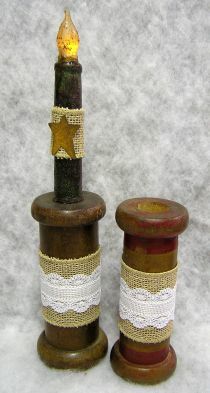 It measures 4 x 4 x 4 and the votive is included. 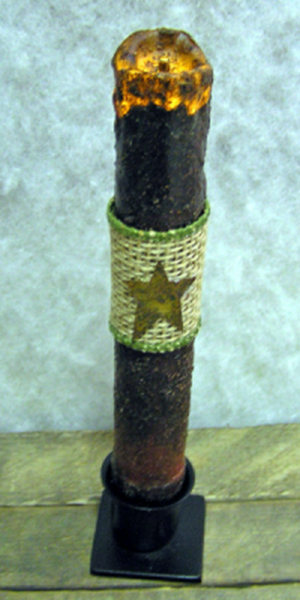 These smaller LED candles feature a burlap band with rusty tin star on them and use 1 AA battery. They measure 4 1/2 x 1 x 1. This LED timer candle features a burlap ribbon around it with a rusty tin star. It uses 2 AA batteries. This rustic look LED candle features a willow tree on the front. It is a timer candle and uses 2 AA batteries. It measures 6 1/2 x 1. This solid wooden spool is our unique candle holder. 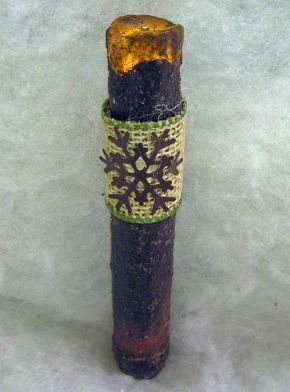 It is wrapped in a burlap lace ribbon. Stain and finish on spools may vary. It measures 6 x 2 1/4. These led candles are unique to Manchester Cottage. 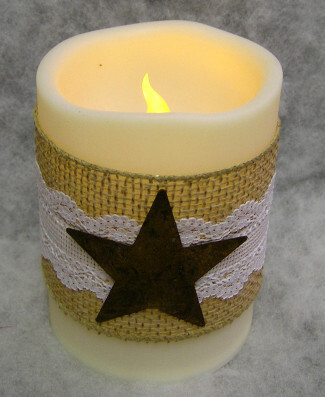 They feature a rusty tin star mounted on a burlap and lace band surrounding the candle. They come in 3 sizes: 4 x 3, 5 x 3, and 6 x 3. 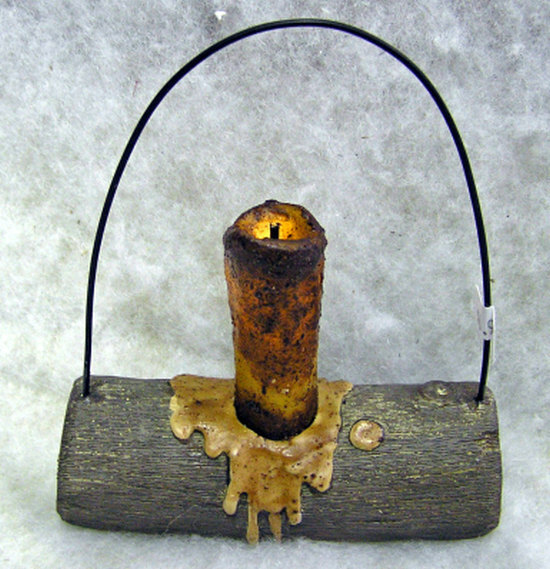 This unique LED candle features a log look holder with dripping candle wax along the sides. It has a black wire hanger and is battery operated. It measures 6 1/2 x 5 x 2. 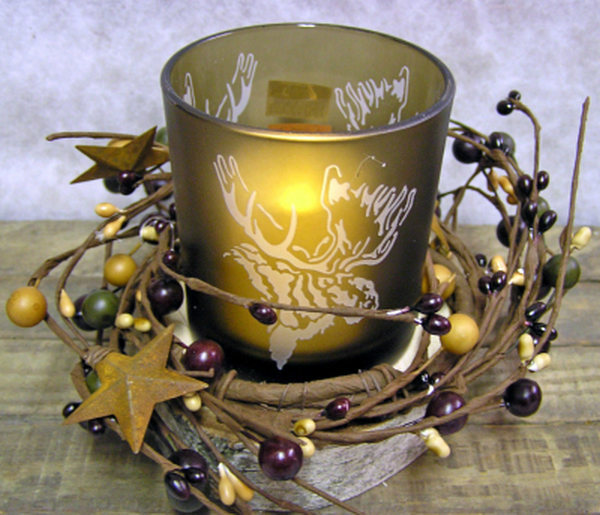 A Manchester Cottage original design, this glass jar has moose embossed around the sides. 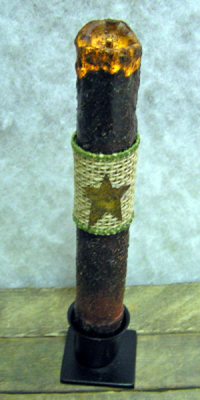 It is mounted on a birch wood base and has a berry/twig/rusty tin star surrounding it. It has a battery operated votive that is included. It measures 4 x 6 x 6. A wood base forms the bottom of this Manchester Cottage original item. 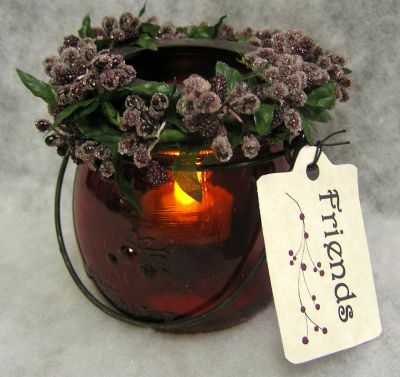 It has a glass jar surrounded by berries and the battery operated votive is included. It measures 2 x 4 x 4. 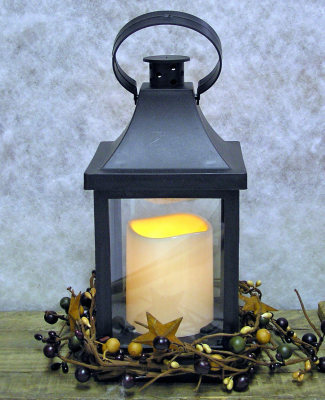 This lantern is unique to Manchester Cottage. It is surrounded by berries and rusty tin stars. Inside is a battery candle that is operated by remote which is included. It measures 10 x 7 x 6. 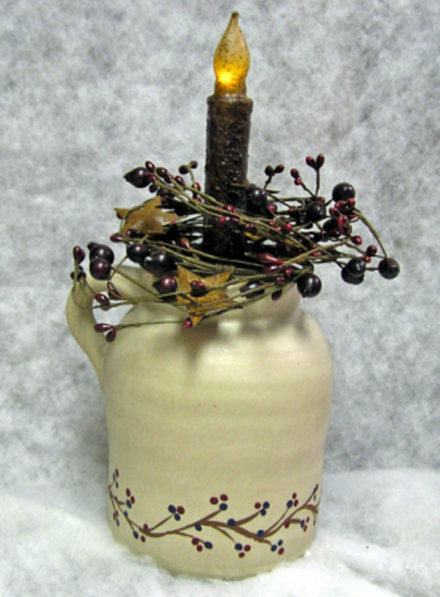 This votive is a Manchester Cottage original design. 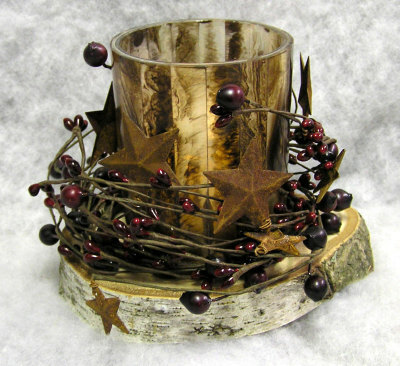 It features a block of birch wood base, marbled brown glass votive, and berry garland with rusty tin stars. It measures 5 x 5 x 5. 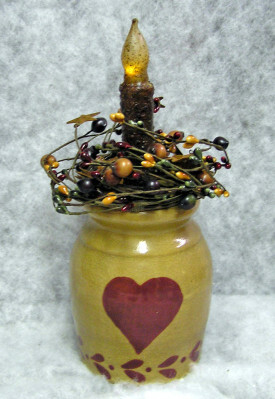 This unique candle creation features a ceramic jar with a heart and berry design on the front. 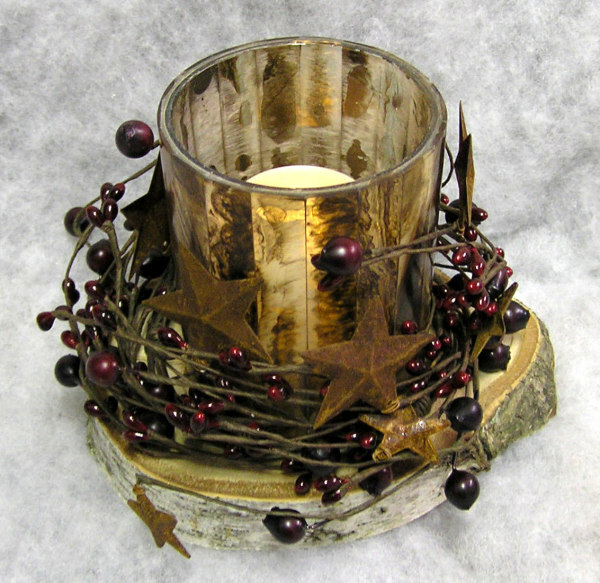 It has a berry tin star wreath, and a rustic LED candle that uses 2 AA batteries. It measures 8 x 4 x 4. This crock has a hand painted berry design around the bottom and a berry tin star ring around the top. 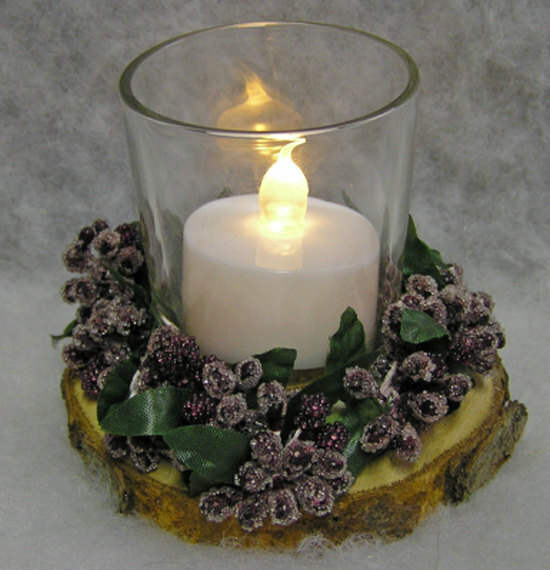 A rustic LED candle is in the center and it uses 2 AA batteries. It measures 9 x 6 x 6. 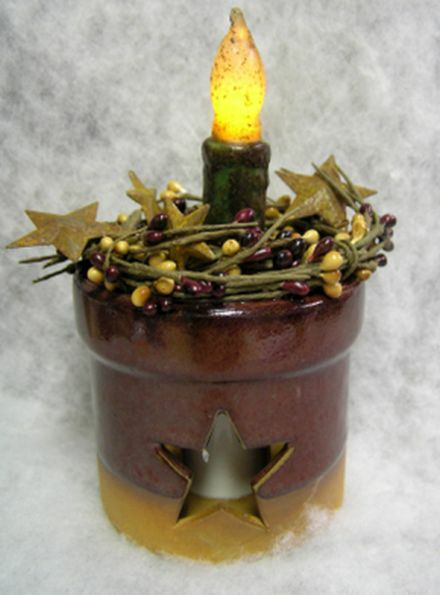 This rustic ceramic crock has a star cut out in the front, berry ring with rusty stars around the top, and an LED candle. The candle uses 2 AA batteries which are included. It measures 8 x 6 x 6.